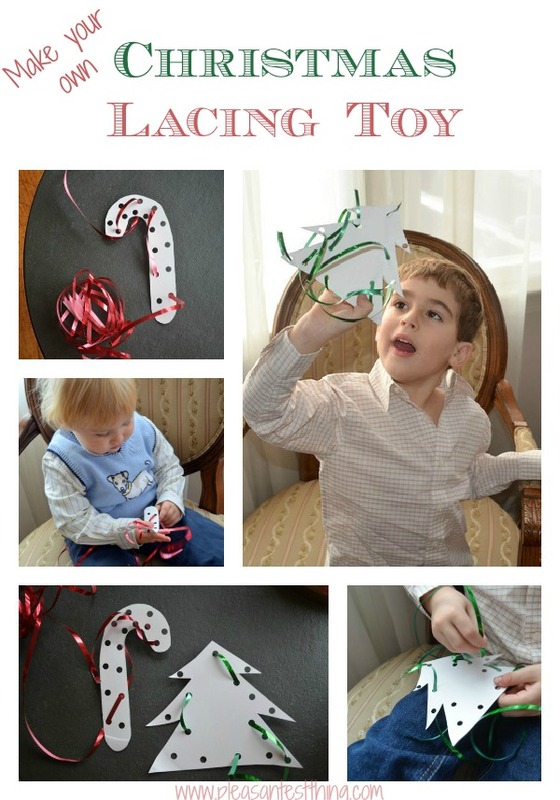 These Paper Plate Christmas Lacing Toys are simple to make – and a whole lot of fun! To make them you only need paper plates, scissors, a hole punch, and ribbon. I wanted to make the boys seasonal lacing toys. I tried a couple of things- cardboard was too hard to put holes in, I only had orange poster board – and then it hit me: I could use paper plates! To create draw the picture you want in the middle of the paper plate, and then cut it out. 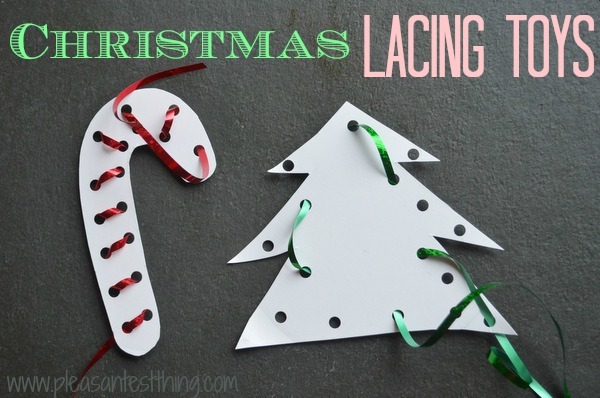 Then use a hole punch to create holes to lace the ribbon through. Add some seasonal ribbon, and that’s it! It only took about 3 minutes to do the whole thing. I will say that they aren’t the sturdiest things- my 16 month old usually did a hole or two, and then had fun tearing them apart. My almost 5 year old sat and very carefully laced his designs. He has used the toys a few times without them breaking. So I guess it’s all in how you decided to play with them! What seasonal toys are your favorites? For more holiday lacing fun, check out the beautiful lacing tree ornaments by Happy Hooligans.